Warning signs of too much stress. What happens if we do not manage stress? What is an optimum level of stress? Although unpleasant events such as study or work pressures, marital problems, or financial worries produce stress; some positive activities such as travel, a new job, mountain climbing, and dating a new boyfriend or girlfriend can also create stress. Stress is a normal part of life. However, if it is prolonged or severe, it can cause severe health problems. 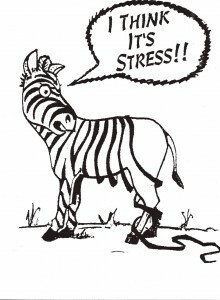 Stress is the mental and physical condition that occurs when a person must adjust or adapt to the environment. Example 1: Hu Jing is a computer salesman who has been transferred to Urumqi in Xinjiang province where the business and cultural environment is very different from what he has been used to back home in Beijing. He will have to do things differently in Xinjiang. Example 2: Li Yunxia is a successful businesswoman who owns a small shop in Shanghai which sells fashion accessories to middle-class ladies. Recently a competitor opened a similar store in the same neighbourhood. Yunxia will have to adapt to this change by either (a) lowering her prices in order to compete; or, (b) expanding her business to include a wider range of choices for her customers. These two people will have to adapt to a changed environment. Hu Jing must adapt to life in another province, and Li Yunxia must adapt to a changed business environment in her hometown. Both people will experience stress as they adjust to their changed circumstances. This is normal stress. Example 1: Zhou Xiping is the dean of an English department who has been promoted to president of the college. Although he is happy with this promotion, he worries that he might not be able to manage all his new responsibilities. Although he knows that he has earned this chance as a result of his hard work over the years, he has last minute doubts about his ability to do this job successfully. He fears the consequences of failure. Example 2: Huang Yibang is an ambitious doctor in small hospital in a rural county. She has just received information about a bus-crash nearby and that many victims will be sent to her hospital for urgent medical treatment. Although she has many years of experience with victims of trauma, she doubts whether her small hospital has the resources needed to cope with so many seriously injured people. In the back of her mind she knows that if she manages this emergency situation well, her prospects of promotion to a bigger hospital will improve. However, she wonders how she and her staff can cope with so many patients, and what will happen to her career prospects if her hospital cannot cope with this unexpected emergency. 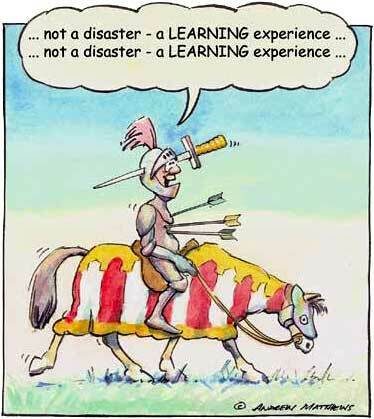 These two people are confronted by new situations which will place high demands on their professional skills. Although they have done their best to prepare for these challenges, they are experiencing high levels of stress as they assess their ability to succeed in these new environments. Managing this type of stress is a balancing act as they walk a tightrope between the stimulating challenge of doing something that they have been working towards for years, and the fear that this task might be beyond their capabilities. This is normal or ‘good’ stress. Good stress can be compared to the electricity which illuminates our homes, operates our refrigerator, and turns on our computer. Good stress can help to make our life more enjoyable and interesting. It can provide stimulation and challenges, and is essential for growth and development. Good stress can help us to function normally in a complex environment. It can help us to do our best. If however, Hu Jing, Li Yunxia, Zhou Xiping and Huang Yibang become overwhelmed by the challenges that face them, it is possible that they will suffer from too much stress. This is ‘bad’ stress. Bad stress can also be compared to electricity. For example; a power surge during an electrical storm can blow the light bulbs in our apartment, burn out the electrical motor in our refrigerator, and destroy data on our hard-drive. Too much stress can cause us to ‘burn-out’ also. If we become overwhelmed with too much stress, our brain and body will not be able to function normally. And when we feel this way, we can çrash just like our computer does when it is overwhelmed with too much information, or is trying to do too many tasks at the same time. Warning signs of too much stress? Avoidance of responsibilities and relationships. Self-neglect. (e.g., neglect of personal appearance. diet, and so on). Poor judgement (wrong choices & decisions). Self-destructive behaviour. (e.g., alcohol abuse, excessive gambling, etc.). Complaints about body aches and pains. These signs are warnings to us that there is too much stress in our lives and that we need to do something about it. If we don’t do something about our high levels of stress, then our mental and physical health will suffer. What happens if we don’t manage stress? Medical research has shown that too much stress can affect our immune system. This system protects us from illness and disease and is partly regulated by the brain. Because of this link, stress and upsetting emotions can increase our susceptibility to disease. Thus if we do not manage our stress, we may become vulnerable to a stress-related illness or disease. Think back to the last time you were severely stressed. After the stress eased, can you recall if you got a cold, a respiratory disease, or some other illness? A stressful period in a person’s life is often followed by illness. How does stress, and our response to it, translate into disease? The answer lies in the body’s defences against stress: in a pattern known as the General Adaptation Syndrome (GAS). 1. Alarm, 2. Resistance, and 3. Exhaustion. In this first stage of GAS, the body mobilizes its resources to cope with added stress. The pituitary gland signals the adrenal glands to produce more stress hormones. As these substances are pumped into the bloodstream, some bodily processes are speeded up and others are slowed. This allows bodily resources to be applied where they are needed. Although we should be thankful that our bodies automatically respond to emergencies, this helpful response can also cause problems. In the first phase of the alarm reaction, people have symptoms such as headache, fever, fatigue, sore muscles, shortness of breath, diarrhea, upset stomach, loss of appetite and loss of energy. Notice that these are also the symptoms of being sick, of stressful travel, of high-altitude sickness, of final exams week, and (possibly) of falling in love! 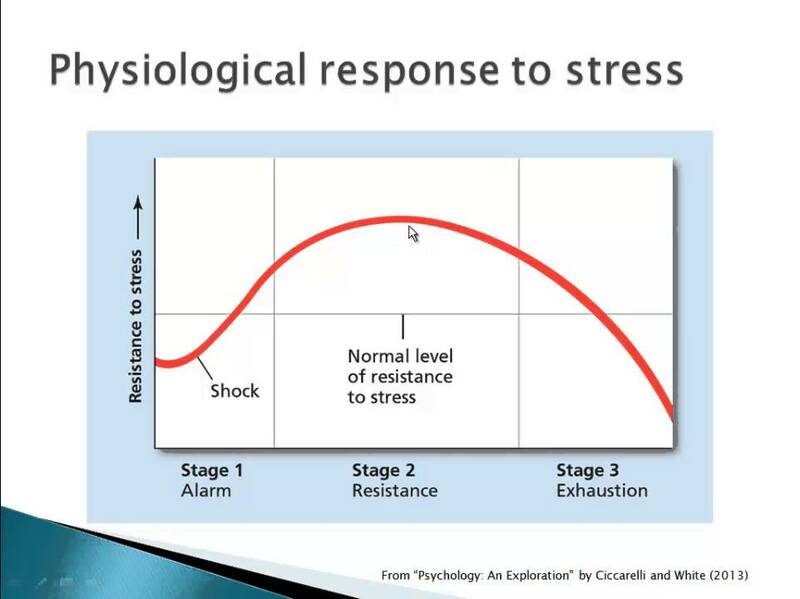 During the stage of resistance, bodily adjustments to stress stabilize. As the body’s defences come into balance, symptoms of the alarm reaction disappear as the body tries to adapt to the stressor. Although physiological arousal declines, it still remains higher than normal as the body replenishes the hormones released by the adrenal glands. 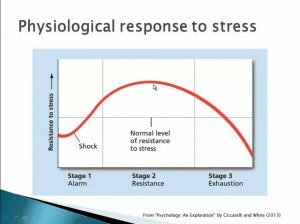 Despite this continuous physiological arousal, the body does not show many outward signs of stress. However, the ability to resist new stressors may be impaired for long periods of time. The outcome of this impairment is that the body becomes increasingly vulnerable to health problems such as ulcers, high blood pressure, asthma, and illnesses that result from an impaired immune system. Prolonged physiological arousal caused by severe long-term or repeated stress is costly. It weakens the immune system and depletes the body’s energy reserves until resistance is very limited. The body’s resources are drained and stress hormones are depleted. Unless a way of relieving stress is found, the result will be a psycho-somatic disease (psycho means mind, and soma means body), serious loss of health, or complete collapse. To reiterate: Our bodies have a limited supply of energy. When we are faced with a stressful period in our lives, we need extra energy to deal with it. So we draw energy from other areas of our body in order to cope with the extra demands that are placed on us by the stress. Usually, we succeed in meeting the immediate challenge successfully because the extra energy we received helps us to do this. But the supply of energy is limited, and this process leaves less energy for other areas of the body. In particular, the immune system is deprived of the energy it needs to do its job of protecting the body from illness and disease. This is why, after we have managed to cope with a stressful period in our lives, we are more likely to get sick. Medical science has demonstrated that there is a link between too much stress and psycho-somatic illnesses. That is; if our minds are burdened with too much stress, our bodies can get sick. These illnesses are real physical illnesses. They are not imaginary. People sometimes die from them. Here is a list of some of these illnesses. They are divided into two groups: 1 Minor illnesses; and, 2 Major illnesses. Gastro-intestinal illness (e.g., stomach cancer). Frightening, isn’t it. So what can we do about it? How can we reduce the risk of suffering from a stress-related illness or disease? Answer: we can learn how to manage the stress in our lives. There are three main strategies for coping with stress. They are: 1. Problem focused coping; 2. Emotion focused coping; and 3. Lifestyle changes. 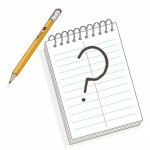 The first two strategies allow us to take charge of immediate stressful situations which otherwise might overwhelm us. The third strategy is long-term preventive medicine or stress inoculation. This coping strategy is used when we know that we can manage the situation which causes the stress. Gaining some control over the situation helps to reduce our stress. Example 1: You have an exam next month. Although you cannot avoid taking this exam, you have time to prepare for it: e.g., you can organise your study environment; develop a study plan; and schedule your time. Example 2: You have a deadline to meet. Although your boss demands that you have your project completed before next week, you can restructure your schedule so that you have enough time to complete this important task. If necessary, you can take your work home with you if this will help you to finish your project on time. You have choices. Example 3: You are a manager, and you have a problem with a member of your staff who cannot work well in a team. His behaviour is affecting staff morale, and this is beginning to affect productivity. This increases your stress because your task is to improve the efficiency of your department. However, there are things you can do to change this stressful situation. For example: you can help him to change his attitude with a one-on-one discussion in private; you can employ a consultant to train all staff on teamwork; or as a last resort, you can fire him and replace him with someone else. You can deal with this problem. This coping strategy is used when you are faced with a stressful situation which you cannot control. You cannot change anything. Question: what can you do about it? Answer: you can change the way you react to the situation. This will reduce your stress. Example 1: Your teacher has just told you that there will be an exam today. You have no time to prepare for it. The only thing you can do is manage your emotional reaction. If you panic, your stress will interfere with your thinking and your memory. It is better to accept this unpleasant reality and focus on calming your emotions so that you can do your best in this unavoidable stressful situation. Example 2: You have an important meeting with a client in his office in downtown Shanghai. However, your taxi is caught in the middle of a traffic jam, and it looks like you will be late. What can you do about this situation which you cannot control? You have two choices: you can either become frustrated and angry and allow this uncontrollable situation to control you and your emotions; or you can concentrate on calming your emotions so that you can do something productive while you wait. Perhaps you could use this extra time to rehearse what you have to say to your client. Example 3: You are overwhelmed by economic and social change. 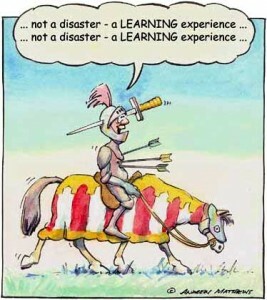 The rate of change is so fast that you do not think that you can keep up with it. Here is another situation which you cannot control. Again, you have two choices: you can either feel powerless and resentful, or you can adapt to the reality of so much change. Persons who cannot manage the stress of this adaptation may drift into the despair of depression and become irrelevant bystanders to the process of change which is occurring around them. You have probably heard about these stress-reducing suggestions before. The problem however, is that most people avoid making the necessary adjustments to their life and routines that successfully managing stress requires. Here are a just a few examples of this type of preventive medicine – I am sure that you know of many more. In the end it is up to us to take personal responsibility for any lifestyle changes that may be needed. Recognise and accept your limitations. Monitor your thinking (banish negative thoughts). Keep your body healthy and strong. Reduce the demands placed on you until you feel in control of the situation. Know where you’re going and have clear goals and priorities. Think positive: turn problems into challenges. Use your energy to solve problems, rather than escape from them. Maintain a strong support network with family and friends. Look after the basics: i.e., maintain a good diet, have good sleep habits, and don’t use alcohol to relieve your stress. Although a couple of drinks is OK, more than this exacerbates stress and causes depression. We now know that it is possible to manage our stress levels by focusing on things in our life that we can control. We also know that we may not be able to change some of the things in our environment which cause stress. The only thing we can do in these situations is to change the way we react to them. Finally, we know that positive lifestyle changes will help us to stay mentally and physically healthy. There is one more change that we can consider however. We can change the way we think about stress. How we think affects how we feel, and how we feel affects how we behave. Negative or pessimistic thinking affects our mood, and negative moods affect our behaviour. This is an important point, because much of the stress that we experience in our lives is caused by our own attitude to life and its troubles. Let me illustrate this point with two examples: two people (A & B) in the same workplace have the same job, the same boss, and the same demands on them to produce good work. However, their attitudes to life and work are very different. Example 1. Person A: John Red feels overwhelmed by the task in front of him. He doubts his ability to cope with the amount of work that is expected of him, and worries about what might happen in the future if he is unable to live up to the expectations of his boss. He notices that his colleague does his job very well, and thinks that if he is not as good as his colleague, he may lose his job. John has many self-defeating habits. He is not well organized and reacts to events rather than anticipating and preparing for them. He has no sense of control over his work environment, and wastes a lot of energy on unproductive or less important tasks. He does not prioritise. He allows small irritants as well as big problems to frustrate and anger him, and does not deal well with these emotions. He complains that his job is too demanding and blames external factors for his poor performance. He feels exhausted at the end of each day, and sometimes wonders how long he can keep working at this pace. John thinks negative thoughts. He is pessimistic and worries about all the bad things that might happen to him. He believes that life is always stressful, and that the future will not bring any change for the better. John is responsible for most of the stress that he endures each day, and as a consequence his productivity is less than it should be. He is also at risk for suffering from a stress-related illness. Example 2. Person B: In contrast, although Jack Green acknowledges that the task is difficult, he believes that he has the skills to do this job well. He expects that there will be disappointments and frustrations, and does his best to overcome them when they occur. He does not waste time worrying about what bad things might happen in the future, and instead concentrates on doing the job to the best of his ability today. He competes against himself rather than his colleagues. Jack anticipates problems before they happen and develops strategies for dealing with unexpected as well as expected events. He organizes his work environment so that he has some control over it. For example: he schedules his working week, and manages his time well. He does not try to do too many tasks simultaneously, and he leaves some room in his busy schedule for ‘thinking’ time. He prioritises competing demands. This sense of control over his work helps him to manage the inevitable stresses that his work imposes on him. Although he may feel tired at the end of each day, he is usually satisfied with his performance. He feels that his work is meaningful and worthwhile. Jack thinks positive thoughts. He is optimistic. Although he accepts that bad things can happen, he has a better attitude to life and its stresses, and believes that the future will be better. Jack demonstrates a more organized approach to his work. He is stimulated by the challenges which face him and is happier and more productive than his colleague. He has a good chance of remaining physically and mentally healthy. Message: We can change how we think and behave. We can learn to be more like Jack. 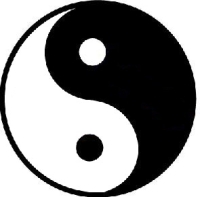 Yin and yang in balance. A certain amount of stress is good for us. Too much stress however, is bad for us. So how do we know how much stress is good for us? Research tells us that people function best, and feel best, at what is for them an optimum level of stress. Although people differ in the amount of stress that is optimal, too little or too much stress impairs their functioning. The figure below gives an illustration of how stress (as a form of arousal) relates to the quality of functioning. 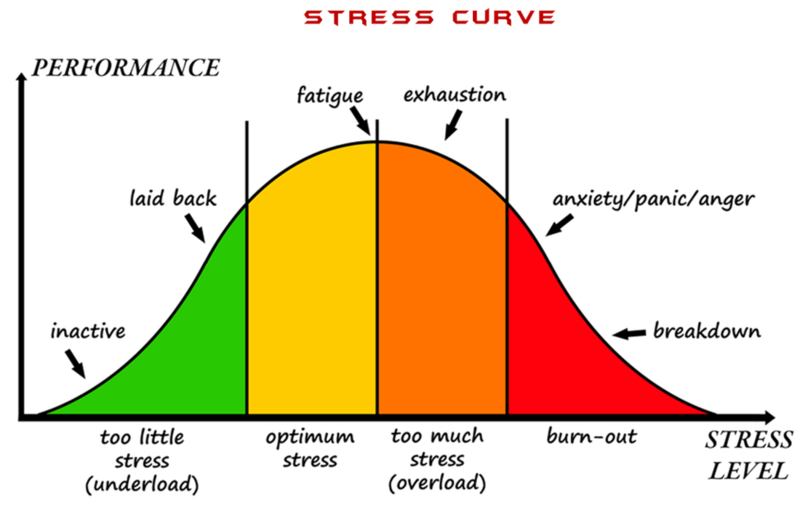 We can see from this graph that functioning is poor at both very low and very high levels of stress. It is best at some moderate or ‘optimum’ level. Example: Imagine that you are in class one day and the teacher asks everyone to do a surprise test. If the test does not count towards your final grade, you might be under-aroused and answer the questions carelessly. But if the test was to count as 10% of your final grade, you might be under enough (optimum level) stress to perform well. But if the test counted for a lot more than 10%, you might be overwhelmed by stress and do poorly. A balance between low stress and high stress is best. 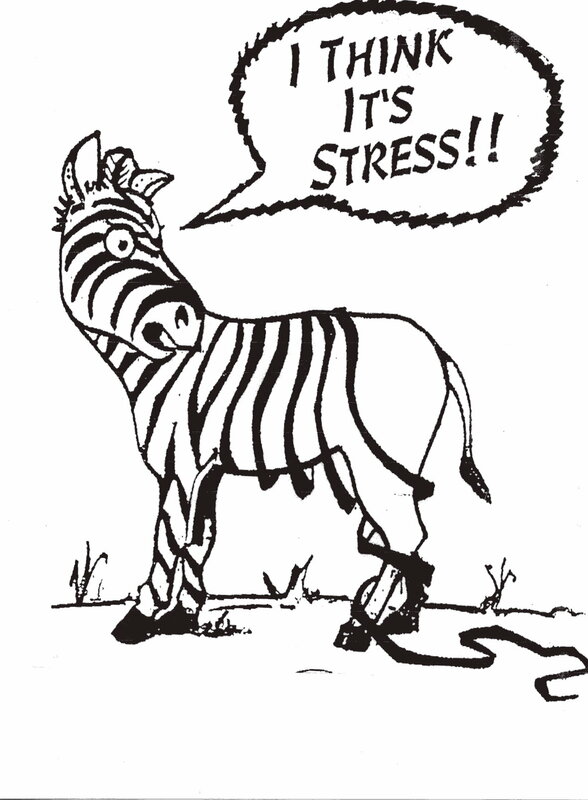 Individuals differ in what is their optimum level of stress. If you would like to know if you suffer from too much stress, here is a test for you. This test divides the signs of stress into six stages or levels of stress, with the first stage being the least damaging to your health, and the sixth stage being the most damaging. Identify any symptoms which may apply to you. Stage 1. The first stage is usually considered to be pleasant, and many people enjoy and become addicted to it. However, energy reserves are being depleted. Perhaps you should consider changing your routines. Maybe you need a holiday. O Ability to accomplish more work than usual. Stage 2. A few less pleasant symptoms are noticed in this stage. Energy reserves do not last throughout the whole day. O Tiredness after rising, or loss of energy after lunch. O Occasional disturbances of bowel function. O Tightness of muscles in the back and around the skull. O A feeling of being unable to relax. Stage 3. Tiredness becomes more pronounced. O Greater disturbances in bowel function. O Increased feelings of tenseness. O Feeling like you want to faint (without actually fainting). Stage 4. Symptoms become worse. O Great difficulty in getting through the day. O Previously pleasant activities are now difficult to engage in. O Withdrawal from conversations, friends, social activities etc. O Increased sleep disturbance. Unpleasant dreams. Early morning awakening. O Negative thoughts and feelings. Stage 5. A deepening of the above symptoms. O Difficulty managing fairly simple tasks. O Extreme disturbance of stomach and bowel. O Pervasive feelings of fear. Stage 6. The final, frightening, stage. O Pounding of the heart, and feelings of panic as a result of a surge of adrenaline. O Gasping for breath. Hyper-ventilation. O Numbness or tingling in the extremities. O Exhaustion. Not enough energy to do simple tasks. As the body’s reserves are depleted, the immune system responds poorly, and we become vulnerable to more frequent illnesses. There may be uncharacteristic mood swings. Previous patterns of behaviour or beliefs may change radically. Extreme tiredness, anxiety, and depression may be evident. If you think that you may be suffering from high levels of stress, please contact a doctor or a mental health professional. He can help you to make the necessary changes in your thinking and behaviour that you need to make. Or maybe you can make these changes yourself. Why not take responsibility for your own lifestyle and your own physical and mental health, and change what you think you can change. Begin with one thing and succeed at it. This way you are more likely to maintain your new commitment to lowering your level of stress. For example, start getting more exercise. You will be surprised at how effective this activity is for lowering stress. Then build another change into your life. You decide what works best for you. Be your own scientist. Get to know your own mind and body. Observe how they are related. Notice how your thinking can affect your mood. Read more about stress. Learn how to control the things which you can control, and how to let go of the things which you know you cannot control. Experiment on yourself. Know yourself. You are responsible for your own life. Nobody else is. Not your boss, or the economy. Not your parents or your spouse. You are responsible for your future. Luck and fate are irrelevant. 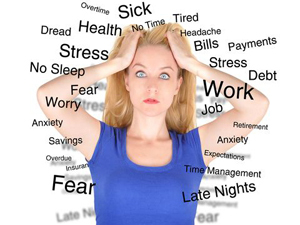 · Too much stress can make us ill.
· We can learn to manage stress. · Managing stress is a balancing act. (If you don’t have a Kindle e-reader, you can download a free Amazon Kindle App for your computer, iPad, or smart-phone etc. ).